All entry to the event is FREE of charge. The Mackay, Whitsunday & Isaac region boasts some of the most pristine and accessible waterways in the country. From the Whitsunday archipelago and Great Barrier Reef, through to the abundant rivers, estuaries and fresh water impoundments. Whether you’re a novice or a seasoned boatie, there is something here for everyone! To highlight the regions rich & diverse marine industry, Pesmackay is proud to announce the third Pesmackay. The festival is designed to showcase all the Mackay region has to offer for those interested in a marine based lifestyle. Nowhere else in the region can people see, touch and compare such a variety of fishing, boating and marine related product in one place. 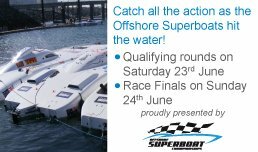 Catch displays, demonstrations, presentations and entertainment from marine dealerships, wakeboarding, PWCs, marine tourism, marine manufacturers, fishing, Offshore Superboats and HEAPS MORE!! !